If you are on the prowl for shampoo, consider buying in bulk. It makes sense to buy bulk shampoo for a variety of reasons. Once you find the perfect shampoo for your idiosyncratic purposes, buying a single bottle will prove wasteful and inefficient. You can save plenty of money and time by buying bulk shampoo. Why so Many are Buying Bulk Shampoo Rather Than Individual Bottles? Once you pinpoint your favorite shampoos, you should load up with bulk orders. Consider the cost and time required to ship an individual small bottle every couple of weeks or months. Those costs will add up quick. Alternatively, you can order bulk shampoo and have large gallon sizes or larger delivered to your door. You will pay less in the long run for shipping when you order bulk shampoo. Furthermore, the cost of gallon shampoo is much lower than that of individual small bottles. Consider the time and energy required to head out to the store to buy small individual shampoo bottles over and over again. Even if you order these small bottles online, the repetitive ordering process will chew up your valuable time. The beauty of ordering gallon shampoo also lies in the fact that the refiling process is simplified. You will rest easy knowing you have one or several gallons on-hand, ready to refill the dispensers and bottles as necessary. You can find organic shampoo, the least toxic shampoo and shampoo of all other varieties in bulk quantities. If you are on the prowl for a gallon shampoo sampler case, look no further than the Beekman 1802 Bath & Body Care set. This sampler case features the popular Beekman Fresh Air Personal Care shampoo products that have a lovely citrus fragrance. The formula is soft enough for regular use on a daily basis. The sampler case includes one gallon size jugs of Beekman shampoo, hand soap, shower gel and conditioner. Each is made with all-natural ingredients so you and your guests won't have to worry about exposure to phthalates, parabens, parrafin and beyond. These products can be used in the home or commercial sites like health clubs, spas and fitness centers. Plus, Beekman just launched a new line of bath and body care products. The Beekman 1808 Dispensary line provides an earthy and sensuous scent designed for unisex appeal. These citrus and aloe blends will clean you and your guests from head-to-toe in quite the refreshing manner. Zogics' plant-based shower gel serves as a shampoo, hand soap and body wash. It is chock full of lovely botanical extracts and essential oils that hydrate the hair and skin to perfection. Zogics' shower gel is made without dyes, EDTA, parabens and other unsavory ingredients to guarantee it is gentle enough for regular use day-in, day-out. 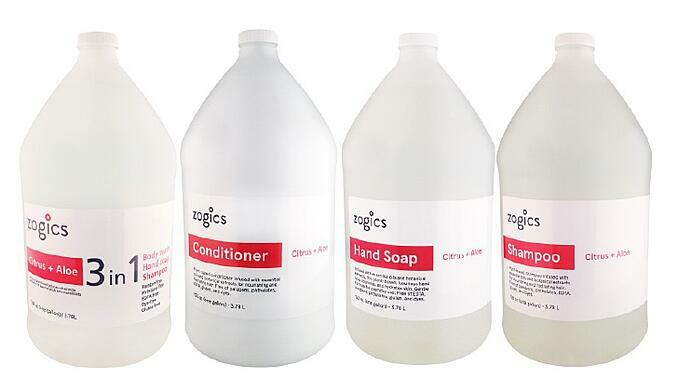 Whether you own or manage a gym, rec center, spa or other facility, your guests will immediately fall in love with Zogics' shampoo, shower gel and hand soap. Order this economical gallon size and you will have plenty on-hand for your clientele. Paya Organics' personal care products provide the body with nourishment by way of nutrients and antioxidants. Each of these sampler shampoos, conditioners, shower gels and hand soaps are made with certified organic ingredients. Extracts used in Paya Organics' products range from organic sweet orange to pink grapefruit, organic papaya, grape seed and organic lavender. This sampler set is perfect for health clubs, fitness centers, recreational facilities and just about anywhere else. If you are searching for a refreshing organic shampoo, look no further than the four gallon case of Paya Organics. This is a luxurious-feeling green shampoo that benefits users as well as the planet. Infused with nutrients and antioxidants, Paya Organics shampoo delivers a refreshing combination of extracts that make the hair washing experience feel like a tropical vacation. Made in the United States and never tested on animals, Paya Organics' one gallon shampoo bottles are ideal for fitness facilities and hospitality-oriented businesses of all types.